Top esports from around the world. It’s another jam-packed weekend in the world of digital sports as the summer tournaments continue to turn up the heat. There’s plenty of action from the League of Legends LCS to the Dota 2 EPICENTRE. We even have the StarCraft II WCS North America Qualifier to look forward to. All the details on this weekend’s events can be found below. 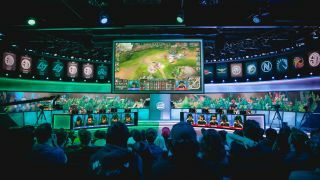 The NA LCS Summer season kicked off last week with a highly anticipated showdown between Cloud9 and Counter Logic Gaming. Cloud9 desperately tried to put their spring playoffs loss behind them, but CLG beat C9 in the first game of the summer split. Team Solo Mid also managed to land a critical blow to C9 after they beat them 2-0. TSM proved that they are still top dog and it was a successful return to the LCS, especially for AD Carry Doublelift, who returned in dominant form. However, Cloud9 are off to a 0-2 start in the 2017 summer split and they will need to be on top form if they wish to take down Phoenix1 and Echo Fox in week two. The full schedule and stream can found by heading over to lolesports.com. G2 showed no signs of slowing down as they took on ROCCAT in their first game of the summer split. Many fans were nervous as ROCCAT had beaten G2 during the final weeks of the previous split, but despite this G2 managed to secure 2-1 victory. Blanc took the reins in game two with his dominant Orianna plays, while Loulex’s Kha’Zix made shockwaves in the jungle in game three. Meanwhile, Unicorns of Love will be aiming to build upon their week one victory when they take on Mysterious Monkeys in today’s matchup. The full schedule and stream can found by heading over to lolesports.com. The group stages have wrapped up and the winners will secure a spot at the playoffs single elimination bracket semifinals, while the second placed team will play against Invictus Gaming in the quarterfinals. Meanwhile, OG finished their EPICENTER journey with only one victory in the group stage, while Na’Vi was knocked out of the tournament without a single win. OG won’t be playing again until The International 7, while Na’Vi will continue to gain tournament experience with their new roster at next week’s Dota Summit 7. The full schedule can be found over on epicenter.gg, while the stream is available on Twitch. The 2017 WCS North America Qualifier will give four of the best StarCraft II players the chance to win travel, accommodation and entrance fully paid to 2017 WCS Valencia. Players have been battling through the gruelling open qualifiers and only the strongest have made it to double-elimination bracket. Matches begin today at 17:00 PDT / 02:00 CEST and continue the same time tomorrow. There’s certainly a lot on the line and anything could happen at this stage of the tournament. The matches can be watched over on Twitch. Overwatch Apex Season three continues to heat up as the qualified teams from each group continue to battle it out against one another. The finals are right around the corner and every team will be trying to claim the $177,055 prize pool. Today’s match will see Team EnVyUs take on X6-Gaming at 03:00 PDT / 12:00 CEST in a match that will decide which team will take the lead in Group A. Meanwhile, the Group B match between LW Blue and CB Spirit starts at 04:30 / 13:30 CEST. Make sure to check out the full stream over on Twitch. The Hearthstone Global Games tournament enters week nine of play today and every team has been fighting hard to claim the top spot in the group stage. Group B’s round five and Group G’s round four matches concluded yesterday for US viewers, but those of you in Europe can catch all the action today at 03:00 CEST. America are off to the best start in Group B with 12 total wins and only five losses, however, it’s a long road ahead for the pros and every team will be fighting hard to secure the $300,000 prize pool. The full schedule and stream for week four can be found here. The top 64 players from the Americas, Europe, and Asia-Pacific have been invited to compete at the Hearthstone Wild Open. The tournament will be played in a best-of-five conquest format with one ban, while regional qualifiers will be double elimination. During the double elimination only the top two players will advance to the single elimination playoffs, where they will be joined by the top two players from China. The qualifiers start Sunday at ​ 11:00 PDT / 20:00 CEST, while the playoffs begin in July. The full schedule and stream can be found here. The Hearthstone action doesn’t stop there as players have been busy climbing the rankings in this year’s StarLadder. Every team will be aiming to secure their place at the grand finals for a chance to win the lion’s share of the $30,000 prize pool. Today’s match will see Naiman take on OMpf at 06:00 PDT / 15:00 CEST, while Group B’s matches start at the same time tomorrow. The full schedule and stream can be viewed over on starladder.com. Heroes of the Storm’s Mid-Season Brawl will see 12 teams from around the world battle it out for the championship title and the $100,000 prize pool. The group stage begins tomorrow and only the top two finishers will qualify for the upper bracket of the double-elimination stage. Tempo Storm are currently the North American favourites after they took first place with only one defeat. Meanwhile, Fnatic followed in similar footsteps after they dominated the European scene, securing 13 wins and only one loss. Make sure you head over to heroesofthestorm.com to find the schedule and stream for all the matches being played this weekend.